Greek legendary singer Babis Tsertos and his band revived the Great Rembetika of Greece (Greek blues) before a full house of guests this past November at the Kaye Playhouse theater in Manhattan during a captivating performance from the concert series, “Greek Music Journey” co-presented by the non-profit cultural organizations, AKTINA Productions, Inc., and CYPRECO Of America, Inc. The concert which lasted for 2 ½ hours covered all three major eras of the rembetiko (rembetika plural), starting from 1922-1932, a period dominated by elements of the music of Smyrna, followed by 1932-1942, the classic period and 1942-1952 the period when the rembetiko was widespread and accepted. The repertoire included songs by all major legendary composers/singers of the rembetiko including Panagiotis Tountas, Marcos Vamvakaris, Vasilis Tsitsanis, Manolis Hiotis, rare songs which originated and were first recorded in the United States as well as “Archonto-rembetika” songs of Michalis Souyioul. Babis Tsertos who connected with the audience from the very start, kept everyone fully engaged throughout the performance. In between he also explained the origins of the songs presented. The crowd comprised by Greek Americans and members of the general audience, was singing and clapping along and there was also a lot of sit-dancing. The Babis Tsertos band was comprised by the leading musicians, Kyriakos Gkouventas, violin/baglama, Dimitris Reppas, bouzouki/guitar/vocals, Ifighenia Ioannou, kanonaki/vocals and Kostas Tsekouras, outi/guitar/vocals, all of whom displayed their talent as a group and individually. Ifighenia Ioannou, a young and upcoming musician/singer was very well received with her impressive performance on the kanonaki and as a singer. She sung several everlasting classics including the great hits by Panagiotis Tountas, “Garsona” (The Waitress), “Lili I Skandaliara” (Lili the troublemaker). 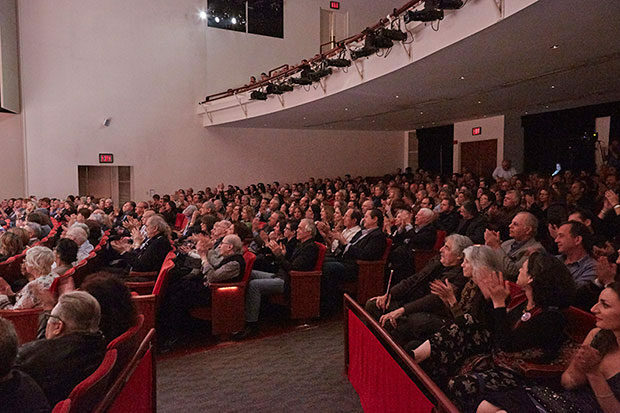 In his welcoming remarks Babis Tsertos thanked the audience and especially the organizers and Elena Maraoulleti, the concert’s Executive Producer for inviting him to perform in New York City and for their commitment to “always produce concerts which highlight the representative aspects of Greek music”. This first collaboration with AKTINA and CYPRECO also marked Babis Tsertos’ debut performance in New York. In recognition of the many contributions of Babis Tsertos to Greek music and for participating in support of Greek Music Journey 2016, the artist was honored with “AKTINA’s Distinguished Artist Award”. This prestigious award is exclusively presented to GMJ participating artists with many years of contributions to Greek music and Mr. Tsertos is the third recipient. Previous recipients were, Lavrentis Machairitsas, Yiannis Kotsiras and Eleni Tsaligopoulou. 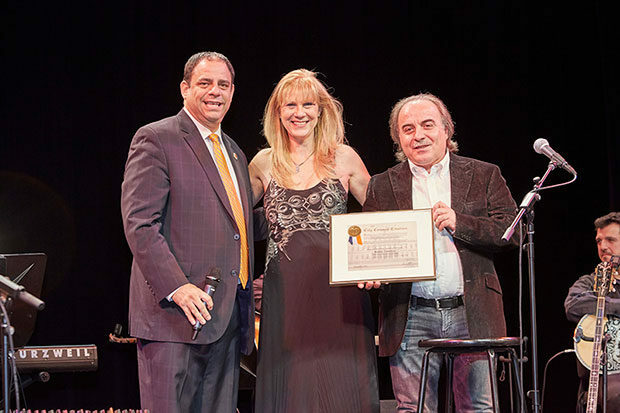 Council Member Costa Constantinides also honored Mr. Tsertos with a Citation on behalf of the City of New York in recognition of her contributions to Greek music and for her participation to GMJ 2016 for the benefit of Greek Americans and of all New Yorkers. During his brief remarks, Council Member Constantinides congratulated Mrs. Maroulleti and the sponsoring non-profits of the concert, AKTINA and CYPRECO for this “successful concert production” and for their “ongoing commitment of bringing to New York unique artists and for presenting exceptional concerts which revive the rich musical inheritance of Greece”. Mr. Constantinides also congratulated Mr. Tsertos and his band for the “memorable concert dedicated to the rembetika”. In accepting the awards Mr. Tsertos, thanked Council Member Constantinides and AKTINA for the “exceptional honor” they bestowed upon him and urged all to “continue to support AKTINA and CYPRECO in their endeavors of promoting the representative music of Greece”. In her brief remarks Ms. Maroulleti thanked the participating artists, the audience for honoring with their presence, everyone who participated and contributed to this production, including all “dedicated volunteers of AKTINA and CYPRECO”, all companies and organizations who sponsored the concert and the Kaye Playhouse technical staff for the superb sound. 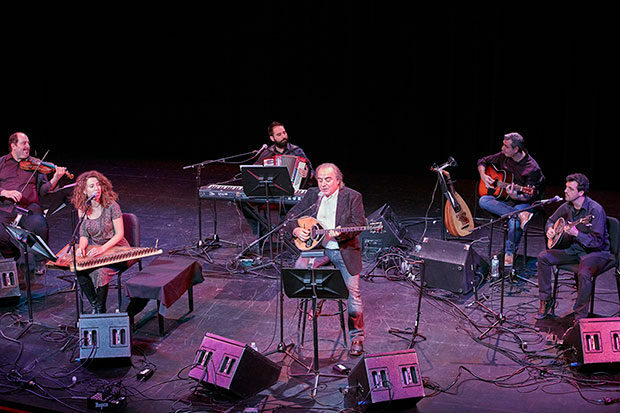 As it was announced, the next two concerts from the series Greek Music Journey will be presented on April 21, 2017 with a new artist from Greece while on November 3, 2017 Lavrentis Machairitsas accompanied by his band and renowned artist Yiannis Zouganelis will be returning to New York for yet another one of a kind performance.